Our school days are often those that we look back on with happy nostalgia, but there are probably some very important life skills that you weren’t taught there. In fact, some of the best lessons we learn come from making mistakes and trying again. Making learning relevant to students is the subject of a study that seeks to incorporate out-of-school learning into science education in the classroom. Using real life examples helps students see that life outside of school is a good place to continue learning. This is especially important since most of us will spend a great deal of time learning outside of school. We are lifelong learners and we absorb new skills as we go about our daily lives. Each day, when you think of it, you are picking up some new piece of information that you didn’t have before. 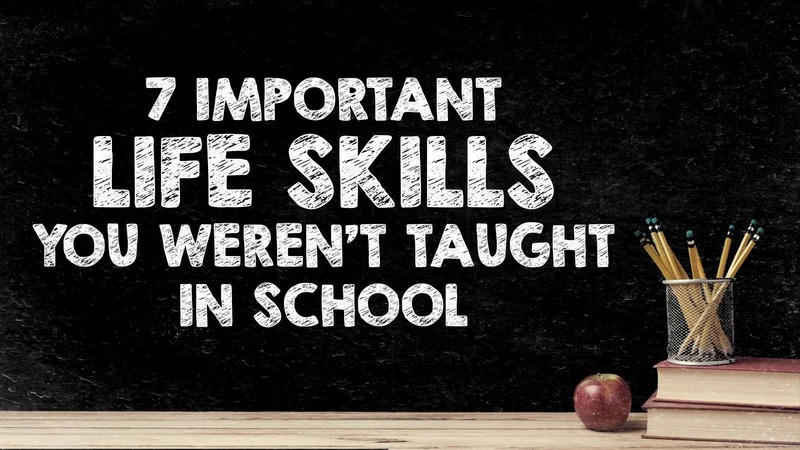 In your later out-of-school days, let’s celebrate these 7 important life skills that you’ve learned since you left school. Your school days were planned. You had a starting bell, timed classes, timed tests, recess, lunch and the end of your day were all scheduled. One of the hardest lessons of all is learning to not focus on what is coming up or what is already past, but what is happening right now. Slowing down your mental focus to allow for the wave of the present moment to wash over you is hard to re-learn once we leave school. Before we start school, we are free to run when we want to run, sleep when we want to sleep, and drink and eat when we want (as long as someone is there to provide it for us). Time constraints were taught, and then you worked to unlearn them again. So much of your school life in your youth is spent obeying your authority figure teacher. It’s rare that you get a choice in anything in school. They tell you where to sit, what to read, when to eat and when to go home. You don’t get to say no to any of that unless you want to be disciplined for it. As an adult, you learned to reclaim your voice and say no to what you didn’t want. Some of us are still learning that we have this power and how to use it. Being a yes-man or woman is always more socially accommodating to the person who asked. But learning to reclaim your “No Power” is a skill that you learned outside of school that serves you well. Your heart knows what it wants, but delayed gratification is taught in school. You can’t have ___ until you ____. When you deny your desires, they are still there, but now you have buried them under the weights of responsibilities, time and money constraints. Listening to your heart when it says “spend the day in the park” instead of going to the office is not a skill that you picked up in school. Your emotions enhance your experience of the world by giving you important feedback about how you feel toward people, actions and words. In school it is more likely than you were taught to stop crying and suppress your anger or frustration rather than lashing out. Of course, as an adult, you learned that suppressing emotions only led to other problems later on. Using your emotions as a cue to make decisions based on what we feel strongly about is a skill that you had to learn as an adult. The knowledge that was taught to you in school left little room for dissenting opinions. There might have been an opportunity to argue in debate or later on in your college years. But in school you were most likely not taught how think independently or argue your case for the opposite viewpoint. The art of respectful dissent is something you learned outside of school. Researchers are now looking at the way that teachers tend to use assertive discipline in classrooms to control student behavior. The assertive discipline approach is based on teachers’ needs for control, but it does not advocate for student needs. They now believe that there are potential negative consequences of assertive discipline, particularly for education in a democratic society. Your love life is certainly an area where most people have to learn by making mistakes, and you definitely didn’t learn anything about love in school. You may have had a boyfriend or girlfriend as a child or young adult, but learning to keep a romantic partner happy by focusing on meeting their needs, communicating, compromising and keeping the passion alive is something you had to learn on your own. Or maybe you read our guide: 10 Tips to Help You Find Your Soulmate.